SBU detains self-proclaimed "deputy chairman of Sevastopol Administration"
The SBU Security Service of Ukraine and prosecutors for the Autonomous Republic of Crimea have detained Oleg Kizimenko, who proclaimed himself as "deputy chairman of Sevastopol City State Administration" after Russia occupied Crimea in March 2014, Ukrainian Chief Prosecutor Yuriy Lutsenko has said. 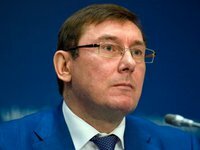 "The investigators consider that by holding such post, he contributed to the formation of the occupying authorities, he shared official documents with them, and also contributed to Russia's subversive activities against Ukraine," Lutsenko wrote on Facebook. Kizimenko was detained under a warrant issued by a Ukrainian court.